The alphabetical list of passers for Region 9 (Zamboanga Peninsula) April 2016 Civil Service Exam - Paper and Pencil Test (CSE-PPT) is now available on this page. 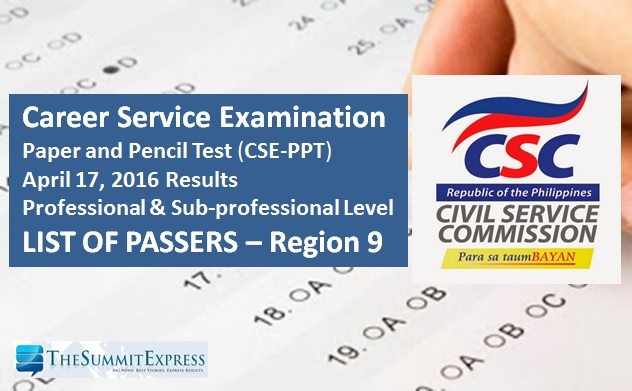 The Civil Service Commission(CSC) announced that 665 passed the professional level exam on these areas: Zamboanga del Norte and Zamboanga Sibugay. On April 17, a total of 229,463 tried to hurdle the exams in at least 57 centers nationwide. CSC announced that passers who got at least 80 percent score will be eligible for the first and second level positions in the civil service provided the eligibles meet the qualifications and other requirements of the positions (education, experience, and training). The commission added that passers should coordinate and verify with the CSCRO concerned for the availability of their Certification of Eligibility (CoE) and the requirements in claiming it. Passers must personally claim their CoE. Representatives are not allowed to claim the same. Claiming of CoE shall be available approximately 30 days after the posting of the List of Passers. Below is the full list of successful examinees for Region 9 civil service exam (CSE-PPT) professional and sub-professional levels. 194 09 343544 DANGPALAN, AL LANDER A.